Minimalist toolkit: lightweight and compact, it fits into the center pocket. Even as a Pre-Cambrian Velominatus, the rusty wires in my brain must have made the connection between my machine’s aesthetics and the lack of a saddle bag; I can’t remember a time when I rode with a European Posterior Man Satchel. But riding without a saddle bag means the tools go in the pocket, and that means great care must be take in their selection; it has taken the better part of 30 years for my toolkit to evolve to the point where it is today: a minimalist set of highly reliable tools, each carefully selected for its function, form, and weight. In addition to the endless cycle of tools that have come in and out of the kit, their locations have changed over the years. I’ve spread them across all three pockets, careful to distribute the weight evenly. I’ve put the heaviest items in the center pocket and kept the lighter ones in the side pockets. I’ve put all the weight in the side pockets and kept the center pocket free for stuffing with other items. I’ve ridden with minipump, with CO2, with minipump and C02. I’ve strapped the pump to my seatpost (we can’t all be genius all the time). I’ve carried two multi-tools, I’ve carried loose allen keys. I’ve carried chain tools. I’ve carried multi-tools with integrated chain tools. Suffice to say, nearly every conceivable permutation has been tried. Before I go on, I want to make a point very clear: here we are wandering deep into Velominatus territory. Every item has been selected for a function, but that function is presupposed by the notion that our bicycles are meticulously cared for and we do not expect to make major roadside repairs. Punctures, silencing a creak or rattle, making a minor shifting adjustment, straightening a handlebar, or tweaking a saddle are the types of repairs within the scope of what may be expected mid-ride. Broken chains, snapped cables, broken spokes, handlebars, or saddles are failures that are to be preempted before departure and if they happen during a ride, one is expected to limp home or find alternative means of transportation. If going on a longer ride with no bail-out, one is to adjust their kit accordingly to account for self-reliance. I used to carry two (or more) spare tubes, several Co2 canisters, and a mini pump. I’m not sure exactly how many punctures I was expecting to have during my rides, but I am sure I was prepared for them. That fact that I rarely flat never figured heavily in my planning. Patch kits have gone from being big clunky things complete with a tube of glue that smelled alarmingly good when opened, to small things you’re more likely to lose than to notice you’re carrying it. Minipumps have become very small and very light, while still providing enough pressure to get you home. C02 chucks have gotten small and light, and are reasonably inexpensive. C02 canisters are similarly inexpensive, and based on how frequently I use them, do not seem an unreasonable investment. Loose allen keys are ungainly and can be lost; a screwdriver even more so. Most of the critical bolts on a bicycle take either a 4mm or 5mm allen key; a screwdriver head is similarly critical as sometimes a derailleur stop needs to be changed. 3mm or 6mm keys are rarely required. Tools are heavy, and the aggregate weight of the toolkit can be significant. Take care to find lightweight, compact tools (that still function well) and you can dramatically reduce the weight you carry with you. Latex tubes are significantly lighter and more compact that standard tubes. iPhones are wicked rad, but Steve Jobs was clearly not a cyclist. Those things weigh like tanks. Nirvana is a state we cannot hope to reach, though La Vie Velominatus may carry us to its outer boundaries. That is where I feel I am today when it comes to my tool kit, the contents of which are the Lezyne V5 Multitool, Lezyne Trigger Drive, Lezyne Smark Kit, two Lezyne Alloy Levers, two 12g Co2 cartridges, my phone, cash, ID, and inhaler (like most Pros, I’m asthmatic). I organize my kit into separate small plastic bags, but do not store the lot in a Rule 31 Sack, like many of my esteemed peers. Instead, I opt to keep things stored separately in my center jersey pocket, such that I am able to pull items such as my phone or multitool out of my pocket (while riding) without needing to remove everything else with it. Huh, where do you keep this then? just ran into this one again. made me think of this post. Lezyne is up there in my list of revered cycling brands, and while PRO (via the Shimano association) has none of the glamour, both together form most of my toolkit, on and off the bike. PRO’s multitool is a tiny thing with every tool I might need (and some I don’t – but it’s small enough not to bother. Their seatpost holds my Arione in place, their tape is what I used to cover their bars, and their storage-bidon keeps tube, levers, keys and phone away from the sweat and heat of my back (useful on those 40c summer days). 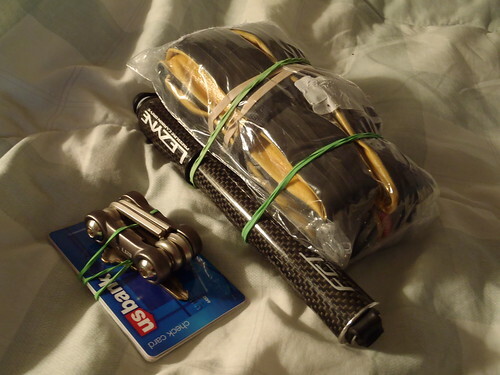 Lezyne, on the other hand, are slightly expensive, but I bought their pumps and never regretted the purchase. Excellent. The Pressure Drive Mini hides neatly next to the downtube cage, while their Classic Floor Drive is a thing of beauty that just happens to be the best pump in the family – and it’s mine. Screw-on hoses are the only way I roll, and after a pinch-flat last week, I learned to appreciate the ease with which the tiny Pressure Drive gets me to 80-90PSI. I aspire to own their cages and tools as well, but that would require a new #1 bike. If you have carbon rims, do not use metal tyre levers. Especially if your rims are Tune Schwarzebrenners which, while hard to spell, are even harder to repair. 2.) ID, debit card, house key, and mini-tool rubber-banded together. This setup has been working like a charm. The tire obviously goes in the middle pocket, and while I was concerned about a hunchback effect, it’s actually pretty low profile. The load is easily supported without bounce or sag by Jersey #1 [Castelli Aero Race 3.1]. Once I get an appropriate pedal cage toe strap, I might employ the spare tubular underneath the saddle when Rule #9 and Rule #21 conditions apply. By the way, the Lezyne pump is Top Notch. Gave it a practice run at home and got to exactly 90psi in 200 strokes without breaking a sweat. It disappears inside a jersey pocket and is super light weight. The flexible hose is a godsend. For all but the most demanding of occasions, I am done with C02. I found something out today at work. Lezyne is a bunch of damn liars. If you measure it on a Lezyne scale it would be exactly 27 grams. I bet that’s why the Park patch kit was so much lighter! It’s a damn conspiracy! I’m bringing this thread back baby! Comment 210 eh? Amazing this whips up such interest again and again. Rapha waved this in front of my face too but I am still using my Lezyne phone/card/cash zippered thing. But yeah, Rapha does not fool around so I bet this is a beauty. And in ten years it will look properly worn and glossy and you will still be using it unless you leave it in a pub after a long ride and too many pints. Doh! Your rollers? You poor antipodean. At least you will be well on your way to the perfect stroke.